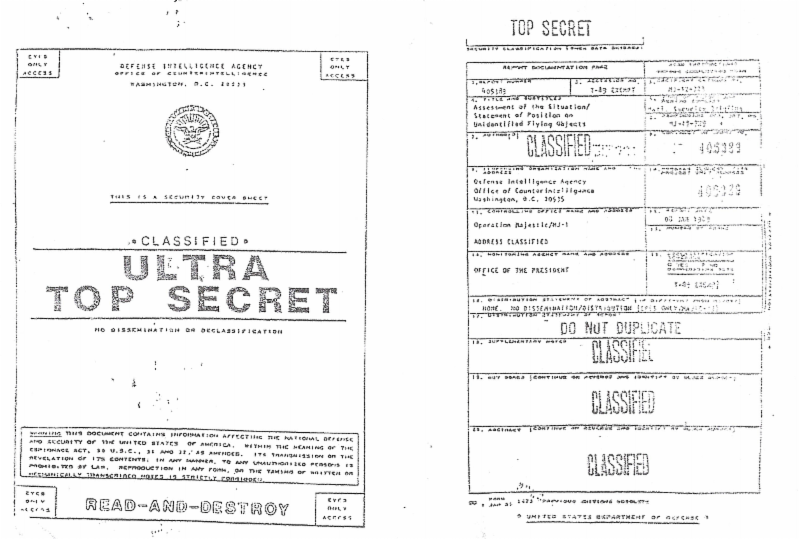 A set of briefing documents related to the alleged Majestic 12 Group has been electronically delivered to the host of Art Bell's Midnight in the Desert, Heather Wade." The documents were provided by sources known to Ms. Wade who wish to remain anonymous at this time. They are new and not previously seen by any researchers in the field. They appear to PRG to be basic briefing materials for persons being indoctrinated into an ET related USAP or the Majestic 12 group itself. government disinformation (limited hangout). Information "leaked" that contains much truth plus bogus elements obvious to skilled researchers - the purpose being to undermine the included truths and serve the truth embargo. disinformation created and dispersed by private citizens who are not connected to or paid by the government and who consider the matter of an extraterrestrial presence to be false and worthy of being thwarted. false information created and dispersed by a person or persons convinced of an extraterrestrial presence in a misguided attempt to advance the issue. The first two options are the most likely and about equal in probability. the cooperative effort announced mid-2016 between musician/author/researcher Tom DeLonge and the Pentagon to release relevant information to the public. the ET related statements from the Clinton team during the election campaign. a message to PRG just after the election on November 9 indicating people within the military/intelligence complex are willing to cooperate regarding the ET issue should the Secretary of Defense reach out to them. the announcement from the CIA two days before the inauguration on January 18, 2017 that 11.5 million pages from previously declassified CIA files had been made more widely available. They included ET/UFO related material. information provided to PRG while in London that persons within the MoD favor ending the truth embargo. the statement from billionaire space entrepreneur Robert Bigelow made on CBS 60 Minutes on May 28, 2017 that an extraterrestrial presence engaging the Earth now is a reality. [Note: PRG executive director Stephen Bassett will appear Saturday evening, June 17 on A Different Perspective with Kevin Randle.